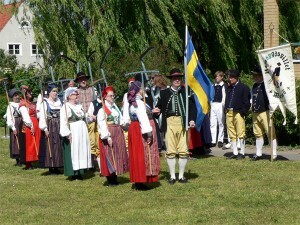 A bit of group history – The association was formed in 1918 and is connected to the Swedish Folkdansringen. We are engaged not only with dancing but we also have activities in various crafts such as weaving, needlework, singing, silversmithing, woodworking and also acting. It was also the reason for having changed the association’s name from the National Dance Friends, which implied that it was only linked to dancing, to the Hembygdsgillet [Homestead] Association, which was considered to cover the association’s activities better. various forms of dances and figure dance layouts. The dances often symbolize the various chores such as harvest dances and weaving dances. The basic steps are typically from Hambo, schottische, polka, waltz, snoa etc., so it is appropriate to learn them first in our beginner courses and courses in old time and dance guild. Our costume – At shows and special celebrations, we wear period costume of various origins. Some dancers have inherited their costumes from past generations, others have made their own. We also have craft sessions for members in costume sewing, where we can weave and sew our own costume. Silver courses are held; where members can produce their own costume silver. We also give short courses such as knife making etc. 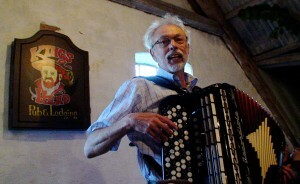 Membership – Our dancers are children, youths and adults and we run courses for beginners in Gammeldance and Gilles Dance. 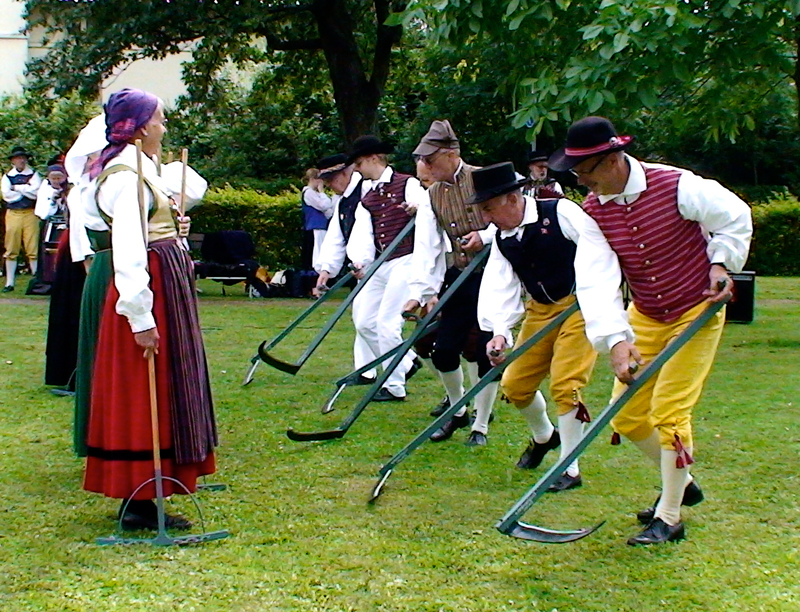 Traditional local events and festival participation – We have an extensive exchange of dancers both in Sweden and in Europe. It gives us the chance to get to know other people, other cultures and countries in a different way to the average tourist. Just remember to get a real English breakfast served, to hike to a remote alpine hut or try some German beer at a brewery. Exchanges give friends for life!